Coin Falls looks like the classic online casino site. It has a great range of games from some of the best providers in the business – backed up with good customer support and usability that helps you get the most out of your time. 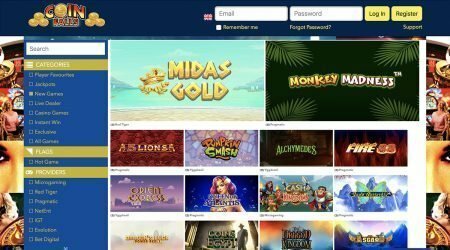 Licensed by the Government of Gibraltar and the UK Gambling Commission, the security and trustworthiness is in place, so you can explore the variety of gaming sections open to you with peace of mind once you have signed up for a new customer account. There is plenty of choice in the online casino market, and customers know what they want, so the trick is to provide a site that is familiar but at the same time stands out from the crowd. Coin Falls looks like an online casino site is expected to look, but it does incorporate a few nice touches, which means that it will get noticed in the crowd. Registering with Coin Falls is a quick and simple process, giving you more time to discover your next favourite game or slot – and there are plenty to choose from on this site. 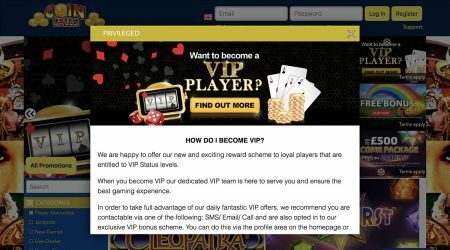 Potential customers to any online casino site are usually attracted by what bonuses are available, or the amount of promotions on offer. Coin Falls is able to provide new customers with the types of deals that keep players interested. We will go into the welcome bonus in more detail in a moment, but there is a lot on offer and new customers will immediately feel like they are being well looked after at Coin Falls. 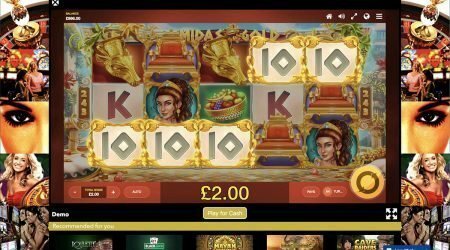 Not content on offering a fairly good initial deposit match bonus, Coin Falls has extended its welcome bonus over your first three deposits – and this could add up to a lot of free credits and free spins. In total, there is the chance to get an extra £500 to play with, but it is broken down into three separate deposits with their own deals. Your first deposit of up to £50 will be matched by 200% with 50 free spins on the ever-popular Starburst game. Your second deposit – up to £200 – is matched by 100%, and you then even get a deposit match on your third deposit, which is 50% up to a limit of £250. This is a great way to start your account with Coin Falls. Not only do you get extra credits thanks to your own deposits, but you also get 50 free spins on the Starburst game. Not bad! There are various requirements that you must meet to make sure that you get the full benefit of the Coin Falls welcome promotion. This is a very standard move by online casinos. They are put in place to ensure that you keep on playing and don’t just take your freebies and go. It also means that you get to see more of the Coin Falls site! 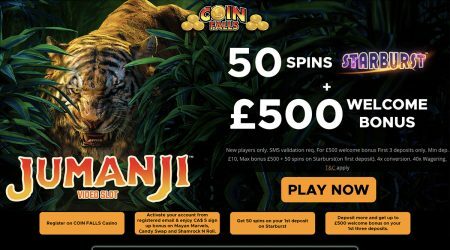 Your deposits must be at least £10 on each go, but as soon as you make that first one, your account will be credited with the 50 free spins for Starburst. All winnings will be in the form of bonus funds and carry a wagering requirement of 40 times the bonus amount. There are a number of games and slots that are not included in this wagering requirement, and the full list can be found on the Coin Falls site. Apart from that, there are only very basic requirements associated with the promotion – you need to be at least 18, and this must be the first time that you have signed up for an account with Coin Falls, The bonus remains valid for a full 28 days after you sign up – if there are any bonus funds still remaining after that time period, then they will be removed from your account. 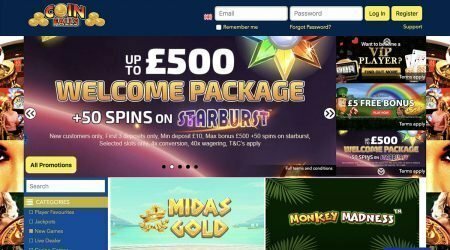 You will now know that you get 50 free spins as soon as you make your first funds deposit, but you can also get £5 absolutely free as soon as you register for an account and validate your mobile phone number. The £5 can only be used on the Shamrock N Roll, Mayan Marvels and Candy Swap games, but you won’t even need to make a deposit – just register and activate. That’s not the end of the promotions either. Once you have signed up and received your welcome bonuses, you can also get fund boosts by making further deposits. There are also a number of cash prize competitions to enter as well as prize draws. There is even a promotion in which winnings are boosted by 15% on a Wednesday. The offers, free spins and giveaways are always going at Coin Falls, but they do change from time to time, so make sure that you check back to the promotions page every now and then so that you don’t miss out on any of them. The selection of games is very impressive at Coin Falls, and you can even “try before you buy” by playing a demo version to get the hang of it before you start staking any funds. With so many games and slots available, Coin Falls has a really good system in place to filter your search, so you won’t be wasting time endlessly clicking onto another screen to find your favourites. Whether it is Cleopatra, Starburst or Thunderstruck, you will be able to choose from all the old favourites and new blockbuster titles. Coin Falls allows you to search by saving your own favourites or choosing from jackpots, new games, live dealers, casino games, instant win and exclusives. You can also filter by games providers if you have a particular favourite – or even by the frequency of the game paying out. The layout of the games section of the Coin Falls site is very easy on the eye and shows off the range of titles in a very good way. The excitement of the games is conveyed without everything being too glitzy, and you get a feeling that you can concentrate on playing your favourites without having to deal with any added extras all the time. There is a good variety of the casino games in particular, so you can find your ideal style and go with it. All the games and slots use a random number generator system, so you know that they are always fair. Although you will already be able to take advantage of the no-deposit bonus of £5 as soon as you validate your mobile phone number after registration, you will need to deposit funds into your new account to carry on playing at Coin Falls. There is a good selection of payment methods open to you as a customer account holder, but you will need to use the same method to deposit and withdraw money. You can choose from Visa and Mastercard debit and credit cards, Skrill, Neteller, Boku, Skrill 1-Tap, Trustly, paysafecard or PayPal. Deposits will usually show up instantly in your account, so you can get playing immediately. All withdrawals are subject to security checks, and so can take up to three business days. If you ever need any help with any aspect of your account or even any of the games and slots on offer at Coin Falls, then you can get in touch with the customer support team in a number of different ways. Telephone lines are open from 8am to midnight UK time, but you can also email and receive a reply within 24 hours. For a more immediate response, you could always opt for the live chat feature. The Coin Falls help team will be happy to assist in any way they can. However, before you get ready to contact the team in whatever way suits you, there is also a comprehensive FAQs section on the site that answers many of the questions that new and old customers alike may have. From basic account details to detailed answers relating to specific payment methods, Coin Falls has really attempted to make signing up for the site as easy as possible. For anyone who is interested in getting into online casinos, Coin Falls is an excellent example of how a site can offer some of the best new slots and games – alongside old favourites – and still look after its customers. The welcome offer is particularly attractive with the possibility to receive matches on your first three deposits. The 50 free spins offer on Starburst is also a great little extra. However, Coin Falls also knows that it has to keep its customers happy after the welcome bonus is gone – and there is more than enough to keep your interest for quite a while after you register.